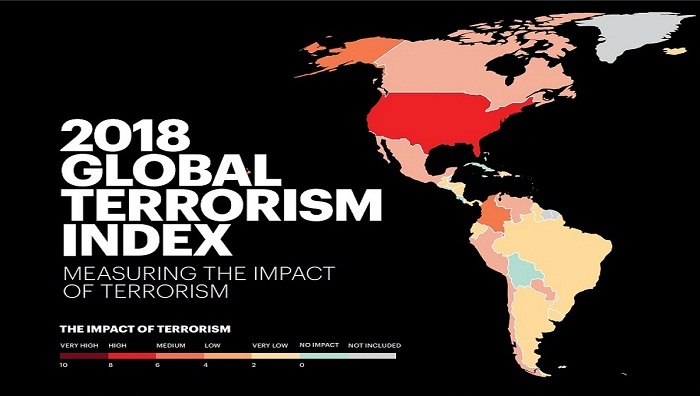 Bangladesh has improved four notches to the 25th place among 163 countries with a score of 5.697 in the Global Terrorism Index (GTI) 2018 of the Institute for Economics and Peace (IEP).Last year, the country scored 6.181 and ranked 21st, according to IEP, a global think-tank headquartered in Sydney, Australia. Bangladesh is among the four nations in South Asia that have experienced decline in terror attacks and showed improvement in security alongside Bhutan, Nepal and Sri Lanka. The GTI is a report published annually by the Institute for the IEP, and was developed by IT entrepreneur and IEP's founder Steve Killelea. In Southeast Asia, the Philippines and Myanmar recorded the highest number of deaths from terrorism in 2017 since 2002, it observed. Myanmar positioned 24th declining 13 notches than last year with a score of 5.916 out of 10. The three deadliest terror organisations in the Asia-Pacific in 2017 were the Arakan Rohingya Salvation Army (ARSA), New People’s Army and Abu Sayyaf Group. ARSA is active in Myanmar and formed following the Myanmar government’s crackdown on the Rohingya population. Afghanistan, Pakistan and India are amongst the 10 countries most impacted by terrorism, and these were causing deterioration to South Asia’s GTI score. In Bangladesh, the largest recent terrorist attack took place in 2016, when an armed assault in Dhaka left a number of people dead, the report said, adding that IS later claimed the responsibility for the attack. The report by the Australian think-tank emphasised the need for global investment to ensure national security, citing as example measures to prevent violent extremism in Bangladesh. “In Bangladesh, for example, the Global Community Engagement and Resilience Fund is supporting training in digital literacy among madrasah students, helping promote critical thinking, and limit the traction and dissemination of online fake news and messages,” the report observed. It highlights that threats to cyber security is the new form of terror adopted by extremist organisations, no one of which can exist without funds. “Terrorism has emerged in cyberspace as a natural response to kinetic security responses and traditional military measures,” the report says. “Financial institutions have long been targets of terrorism, and this is true online as well. In the case of the 2016 Bangladesh Bank heist, malicious programme, likely malware sent through an email, was installed on the bank’s computer system. “The malware then collected passwords and usernames, and deleted evidence of its own presence, rendering it virtually invisible. These stolen credentials were then used to access SWIFT, the most secure global money transfer system. 81 million USD were lost in four transactions,” the think-tank said in the report.